Taiwanese Motherboard manufacturers have leaked details of AMD’s Upcoming Bulldozer CPU’s and Release Date. According to them, AMD will start Mass Production of B2 chips in August and the processors will officially launch in September (Q3 2011). A recent cinematic trailer has also exposed Bulldozer Launch Date of 19th September 2011 which you can see here. The AMD Bulldozer lineup consists of 32Nm SOI based chips which will be supported by the AM3+ Socket featuring the AMD 990FX Chipset. The first Q3 2011 lineup which will be released in September would consist of Four processor models, The FX-4100, FX-6100, FX-8100 and FX-8150. We already detailed these processors over here . The AMD Bulldozer FX-8170 will dominate the Bulldozer lienup with its massive 3.9Ghz Stock speed with turbo upto 4.5Ghz. 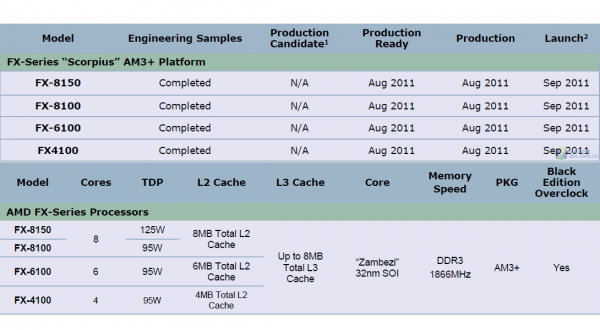 Coupled with 8 Cores, 8MB L3 Cache, DDR3 1866+mhz Support, AM3+ compatibility and 125W TDP.